The Mount David Summit is Bates’ annual campus-wide celebration of student academic achievement. 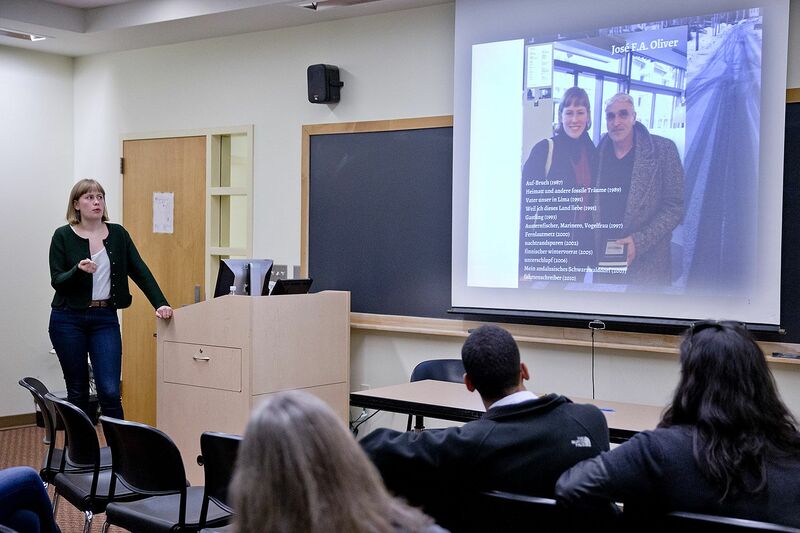 The Summit highlights undergraduate research; student creative work in art, dance, theater, music and film/video; projects conducted in the context of academic courses; and community-engaged research. The Summit spotlights the rich intellectual life of our students. 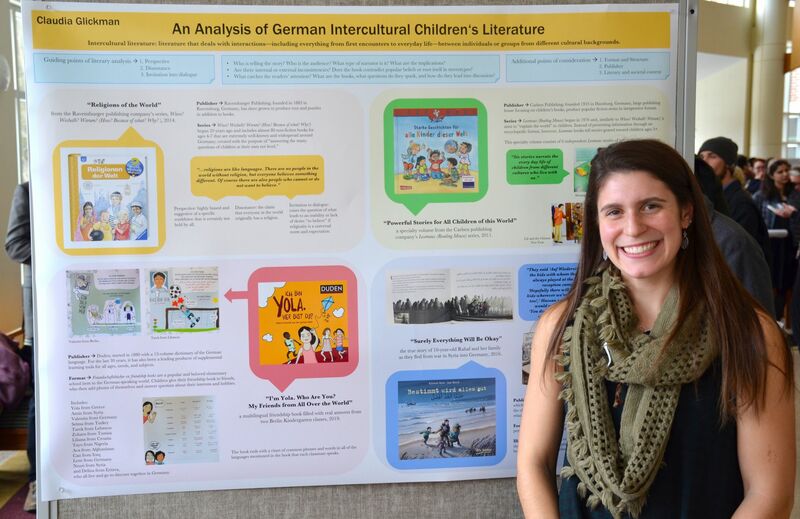 This project analyzes modern German children’s books to uncover the ways in which they depict (or don’t depict) intercultural environments and interactions. Starting from the history of children’s literature and the emergence of intercultural communication as its own subgenre, I develop criteria for analysis to look more closely at a collection of popular contemporary books. The children’s books are compared and contrasted for their approach to the topic of interculturality, as well as for the messages they send to their audience about the diversity of German culture. Following the end of the Second World War in 1945, about three million German-speaking Czechoslovak citizens were deported, primarily from the border region of the Sudetenland, to Germany. These citizens were accused of their allegiance to Nazi Germany, which invaded Czechoslovakia in 1938. 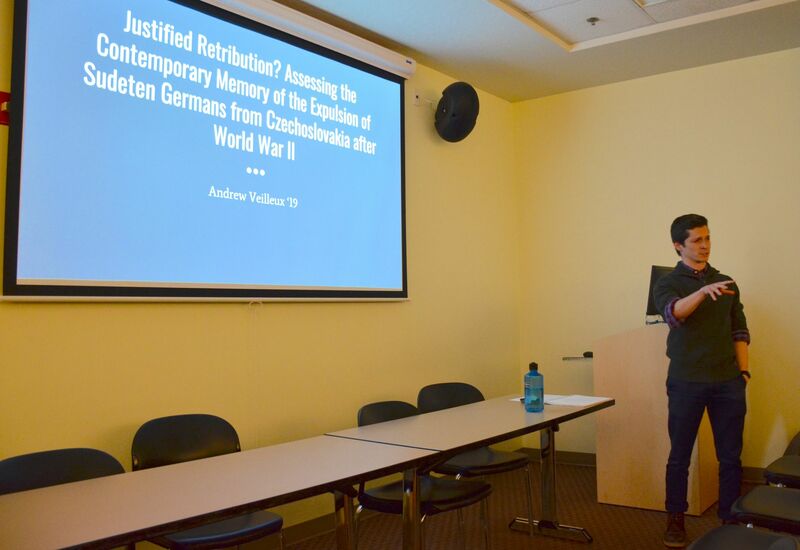 My research focuses on how the memories of these events are constructed today within the Czech Republic. This past February, I traveled to a series of memorials and museums in Prague to learn about how contemporary collective Czech identity focuses on the victimization of their 20th-century history rather than address what many scholars have begun to describe as ethnic cleansing. Berlin’s tenement buildings, or Mietskaserne, were widely criticized when they were first built in the late 19th century. Today, the tenement buildings house desirable modern apartments, and in some cases, boutique shopping complexes. 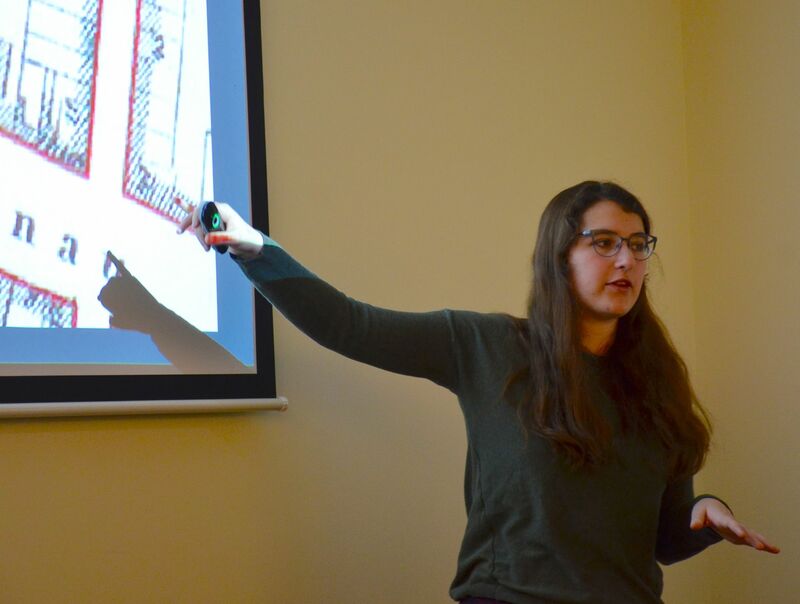 This presentation discusses the question: How do narratives of nostalgia for the late 19th-century and images of the working-class tenements interact with the forces of gentrification? Evidence will be presented in the form of photographic documentation of the buildings, a comparison of historical and contemporary discussions of the tenements in the press, and a discussion of the reception of artistic depictions of the historical Mietskaserne. I am focusing on and analyzing two of the films from the acclaimed German director Rainer Werner Fassbinder, Ali: Fear Eats the Soul (1974) and The Merchant of Four Seasons (1971). They highlight how Fassbinder departed from the “male gaze,” a term that was first proposed by Laura Mulvey in Visual and Other Pleasures (1988). I argue that Fassbinder uses this gaze in shots containing secondary characters to establish a contrast with how he frames his protagonists within the scene. The two films contain “castrated-male” protagonists and function especially well as examples for two types of gaze that Fassbinder uses. Last October, the Friedrichstadt-Palast in Berlin premiered The One, a revue featuring song, dance, acrobatics, and special effects. The show’s constructions of physical and social spaces draw upon Berlin’s unique cultural history. As a major tourist attraction, its portrayal of this history helps define contemporary understandings of the city and its past. My study analyzes the spatial constructions in The One with a concentration on how it represents cultural institutions associated with Berlin and how it mediates the perception of the city for an international audience. This panel examines contemporary narratives which are shaping Russia’s national identity. Participants present their research on diverse cultural and political texts which are in the center of current public discourse in Vladimir Putin’s Russia. These include monuments and memorials, films and events produced by state media, and narrative arguments presented by political figures surrounding President Putin. Using documentaries and press conferences portraying the president to the Russian people, investigating national landmarks preserving the memory of the country imagined as Russia, and analyzing Russian cultural and historical claims to Crimea, presenters deconstruct Russia’s search for identity. My German studies thesis engages place-based poetry in German and the United States. Split into three chapters, the thesis includes literary analysis and translation of SpanishGerman poet José F. A. Oliver as well as my personal writing. In doing so, it showcases the ability to connect faraway and culturally distinct places through the human experience of difference. Whether in countries, cafés, or the forest, Oliver’s perception of himself and his sense of identity and home is reflected in his writing; regardless of background, these concepts transcend language. 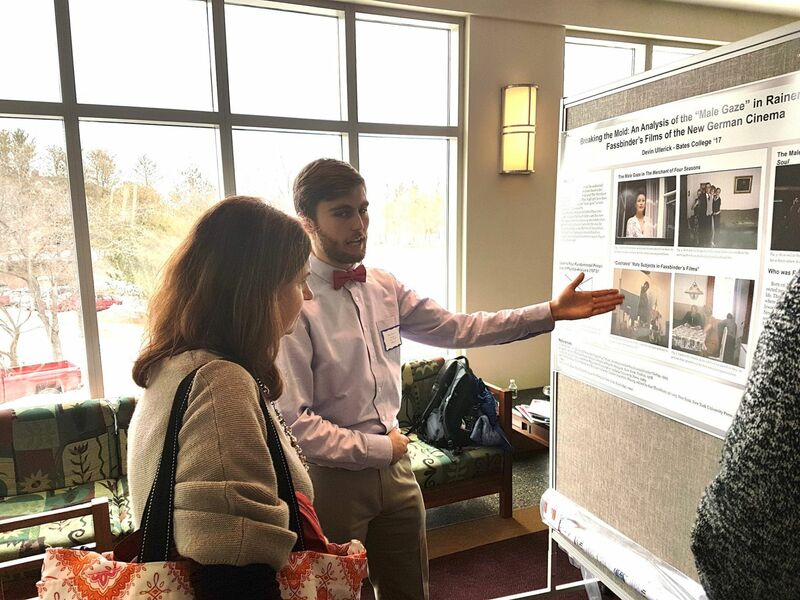 M. Lane Peterson ’15 presents at the Mount David Summit. Photo: Phyllis Graber Jensen/Bates College. After a history of religious wars, movements, and suppressed religious activity during Communism, the Czech Republic continues to secularize. How do Czechs understand themselves, individually and nationally, within this secular context and how can the secularity of the Czech Republic be explained? A vital source of information for my thesis came from the interviews and surveys that I conducted while on a Barlow-funded research trip in the Czech Republic this December. I lead listeners through the activities and interview methodology I used so that they could better understand how I went about collecting the material that I use to explore my questions. I want listeners to place themselves in the shoes of my interviewees to gain a sense of how they conceptualize their own ideas about their identity in relation to spirituality, religion, and nationality. In 2000, Germany faced an educational crisis. The release of the PISA scores, an international test given to 28 OECD countries measuring academic abilities of 15-year olds, showed that Germany scored significantly below average. The long-held belief of German academic excellence was shaken, but it was not clear if the “PISA-Shock” would result in sufficient public and political support to reverse a 50-year trend of resistance to the development of a comprehensive school program. Were PISA to be as great of a shock as the media made it out to be, then it is to be expected that real reforms would be made to the education system as public pressure mounted. On the 70th anniversary of the liquidation of the Warsaw Ghetto, an unfinished museum was opened on land of the former ghetto. The POLIN Museum of the History of Polish Jews commemorates Jewish Poland over the last 1,000 years and its prosperity and destruction. The core exhibition opened to the public in October 2014. After interning at the Galicia Jewish Museum in Kraków and traveling back to Poland to visit both sites I consider these two museums as case studies on the importance of Jewish museums versus Holocaust museums and their cultural contexts in Poland. This study analyzes how the German public opinion was shaped by the press reports of the integration process of Poland into the European Union, as presented in three weekly newspapers: FOCUS, Der Spiegel, and STERN from 1994 to 2004. In order to understand the implications of the formal access to the European Union in 2004, I offer a brief history of the geopolitical relations between Germany and Poland following World War II, and examine the progression of Poland’s integration preceding its access to the European Union between 1989 and 2004. Prior to the finalization of Poland’s membership into the European Union, European policymakers – primarily the institution responsible for European integration (the European Commission) – raised questions about Poland’s fulfillment of all criteria requisite to join the union. Would Poland’s economic transition from a communist, state-controlled market to a liberal market economy meet the standards established by the European Union? If a country were not able to fully liberalize its market and produce goods competitive with other European lands, the influx of foreign investment and goods could cripple the burgeoning free market. The sentiments shared by policymakers were echoed by the three publications. After opening negotiations with the European Union in 1994, the further liberalization of the Polish economy was chronicled by the three weekly publications. This study finds that the press’ presentation of the integration mirrored the concerns issued forth by the governing bodies of the European Union. This thesis explores the themes of food, work, and love and the difficulties of survival in post-World War II, Soviet-controlled, Transylvanian Saxon villages. The unique group of ethnic Germans who settled Transylvania in the 11th century suffered at the hands of the Soviets who sent many of the Sachsen men and women to forced labor camps in the USSR to help rebuild that country from the devastation of the war. With much of the workforce removed, mostly children and the elderly remained and had to maintain the villages on their own. This study examines the necessities of the body, mind, and soul of the remaining Transylvanian families in conjunction with those sent to labor camps in Russia. Based on Transylvanian author Karin Gündisch’s popular children’s book Weit, hinter den Wäldern (Far, Beyond the Forests), this study explores the daily trials, tribulations, and joys of the agrarian Saxon families, communities and culture in their struggle to retain their unique identity. Gündisch’s text was chosen because of her unique identity as a Transylvanian of German heritage and her nuanced depiction of Soviet-controlled Transylvania during the post-war period. The thesis follows three major themes: food, work, and love, which together portray the post-war conditions and the necessities for survival. This study examines the usage of food as a metaphor in French and German cinema and the implications of these food metaphors on their respective cultures. In examining the works of two directors, Fatih Akin and Abdellatif Kechiche, I considered various symbolic usages of food in their films. The directors used food to comment on topics such as inclusion and exclusion, national and cultural identity, and hybridization. These topics work to promote the discussion of inter-group relations in both France and Germany. The inclusion of food as a universal symbol is an attempt to reinforce the sociopolitical themes presented in the films. While universally applicable, food metaphors are also used to highlight aspects of one specific national or cultural group. This duality works to further a discussion of cultural diversity in a variety of directions. Each has an immigrant background that informs their films, though neither make films typical of the “immigrant film” genre. Six films were chosen to provide a sufficient breadth while allowing for a depth of study: La faute à Voltaire (Blame It on Voltaire, 2000), Gegen die Wand (Head-On, 2004), La graine et le mulet (The Secret of the Grain, 2007), Auf der anderen Seite (The Edge of Heaven, 2007), Soul Kitchen (2009) and La vie d’Adèle (Blue is the Warmest Color, 2013). Traditional film analysis methods were applied to specific scenes where food is present, and this analysis was used to develop an understanding of the usage of food as a metaphor. In addition, sociological theories of food were applied to these scenes, which were examined both sociologically and anthropologically. Theoreticians included Eva Barlösius, Gerard Genette, Pierre Bordieu, and Erich Auerbach. This presentation focuses on the complexities of transcription, translation, and subtitling of a Russian movie. We examine subtleties of the differences between the two languages, and the difficulties in adapting a movie script to a subtitle format in a way that is accessible to a foreign audience. We demonstrate this by comparing the literal translation of various movie excerpts and our work. A common problem in upper-level foreign-language learning is the abrupt transition from language and grammar focused courses to purely content-based courses taught in the language of instruction. This can come as a shock to many students who are not used to the sense of immersion necessary to develop a high level of skill in an academically learned language. With this problem in mind, students and professors from Bates and Colby colleges have begun to construct a German language reading database with various texts and articles accessible to students of all levels of language instruction so that they can become accustomed to reading in a content-based context before they begin to take content-based courses. By constructing a user-friendly, expansive, and fun database, we hope to expose students of all levels of German to interesting and insightful content that will prepare them for higher level courses which focus less on sentence structure, vocabulary, and grammar, more on abstract concepts and personal inquiry. This presentation explores the ways in which the mood of Russian poetry can be translated into English. This involves a variety of poetic maneuvers. Among these maneuvers are content, rhyme, meter, word choice, symbols, and sounds. This presentation looks specifically at the poetry of poets Anna Akhmatova and Joseph Brodsky, two of the twentieth century’s most renowned Russian poets. Anna Akhmatova is regarded as the grand dame of Russian poetry. Her ability to translate quintessential elements of the Russian experience into verse is unparalleled. Akhmatova served as Brodsky’s mentor and anointed him as the next great Russian poet. Besides being a poet, Brodsky is well known as a translator, and translated many of his own poems from Russian into English. His own tactics for and philosophy of translation play a large part in understanding of the ways in which the mood of a poem in one language can be transmitted successfully, or not, into another language.